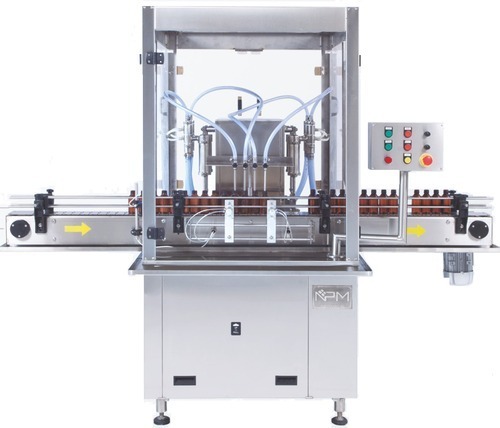 NPM Automatic Volumetric Liquid Bottle Filling Machine works on volumetric principle with diving nozzles. The unit is made compact, versatile and enclosed in stainless steel elegantly matt finish body, consists of S.S. Slat Conveyor, Reciprocating Nozzle with self-centering devices & SS Syringe. No container No filling system arrangement is standard features of the machine. · ±1 % Filling accuracy on single dose. · Rigid vibration free construction for trouble free performance. · SS Elegantly matt finished body. · Elegant and easy control panel for total control on operation. · Minimum charge overtime, from one size to another container or fill size. · Self-lubricating UHMW-PE guide profile for S.S. slat chain provide low friction wear surface, smooth and noiseless conveying. · Error code display on A/C frequency drive on control panel. · Drain tray around machine platform. · Drip tray under the conveyor. · Pneumatic bottle stopping arrangement. · Synchronized two nos. A/c drives for main motor & conveyor belt. · Safety guard for conveyor gearbox, motor and pneumatic cylinders. · MCB for over load protection, and prevent against short circuit.